Obverse: Lovely young woman vignette. This vignette is titled "Miss Ann Izzard", the engraving is by Charles A. Brooks. 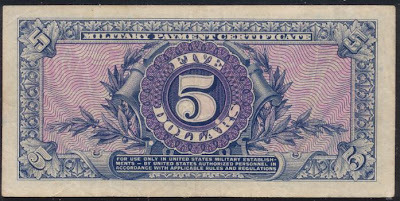 Reverse: Denomination: 5 - Five Dollars. 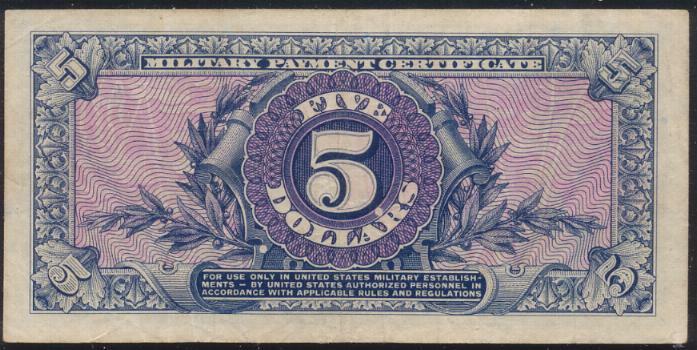 Series 591 military payment certificates are a pretty easy issue to understand. As per usual, there were seven denominations issued, five cents, ten cents, twenty-five cents, fifty cents, one dollar, five dollars, and ten dollars. Five dollar notes are much rarer than any other denomination; tens are the second most valuable. However, those values certainly do not apply to replacement notes. Standard issue series 591 notes should have a serial number that begins and ends with the letter G. If the serial number on your note does not end with G, then you have a series 591 replacement. Those are especially rare for twenty-five cents, fifty cents, and five dollar denominations. These military payment certificates were only issued in Cyprus, Iceland, Japan, Korea, and The Philippines. There was a much smaller demand, so only about 94 million in face value was issued. Series 591 MPCs were used from May 26th, 1961 until January 6, 1964. They also happen to be the last issue printed by Forbes Lithograph Corp.